Once upon a time the fairies of the west, going home from a hurling-match with the fairies of the lakes, rested in Dooros Wood for three days and three nights. They spent the days feasting and the nights dancing in the light of the moon, and they danced so hard that they wore the shoes off their feet, and for a whole week after the leprechauns, the fairies’ shoemakers, were working night and day making new ones, and the rip, rap, tap, tap of their little hammers were heard in all the hedgerows. The food on which the fairies feasted were little red berries, and were so like those that grow on the rowan tree that if you only looked at them you might mistake one for the other; but the fairy berries grow only in fairyland, and are sweeter than any fruit that grows here in this world, and if an old man, bent and grey, ate one of them, he became young and active and strong again; and if an old woman, withered and wrinkled, ate one of them, she became young and bright and fair; and if a little maiden who was not handsome ate of them, she became lovelier than the flower of beauty. The fairies guarded the berries as carefully as a miser guards his gold, and whenever they were about to leave fairyland they had to promise in the presence of the king and queen that they would not give a single berry to mortal man, nor allow one to fall upon the earth; for if a single berry fell upon the earth a slender tree of many branches, bearing clusters of berries, would at once spring up, and mortal men might eat of them. But it chanced that this time they were in Dooros Wood they kept up the feasting and dancing so long, and were so full of joy because of their victory over the lake fairies, that one little, weeny fairy, not much bigger than my finger, lost his head, and dropped a berry in the wood. When the feast was ended the fairies went back to fairyland, and were at home for more than a week before they knew of the little fellow’s fault, and this is how they came to know of it. A great wedding was about to come off, and the queen of the fairies sent six of her pages to Dooros Wood to catch fifty butterflies with golden spots on their purple wings, and fifty white without speck or spot, and fifty golden, yellow as the cowslip, to make a dress for herself, and a hundred white, without speck or spot, to make dresses for the bride and bridesmaids. When the pages came near the wood they heard the most wonderful music, and the sky above them became quite dark, as if a cloud had shut out the sun. They looked up, and saw that the cloud was formed of bees, who in a great swarm were flying towards the wood and humming as they flew. Seeing this they were sore afraid until they saw the bees settling on a single tree, and on looking closely at the tree they saw it was covered with fairy berries. The bees took no notice of the fairies, and so they were no longer afraid, and they hunted the butterflies until they had captured the full number of various colours. Then they returned to fairyland, and they told the queen about the bees and the berries, and the queen told the king. The king was very angry, and he sent his heralds to the four corners of fairyland to summon all his subjects to his presence that he might find out without delay who was the culprit. They all came except the little weeny fellow who dropped the berry, and of course every one said that it was fear that kept him away, and that he must be guilty. The heralds were at once sent in search of him, and after a while they found him hiding in a cluster of ferns, and brought him before the king. The poor little fellow was so frightened that at first he could scarcely speak a word, but after a time he told how he never missed the berry until he had returned to fairyland, and that he was afraid to say anything to anyone about it. 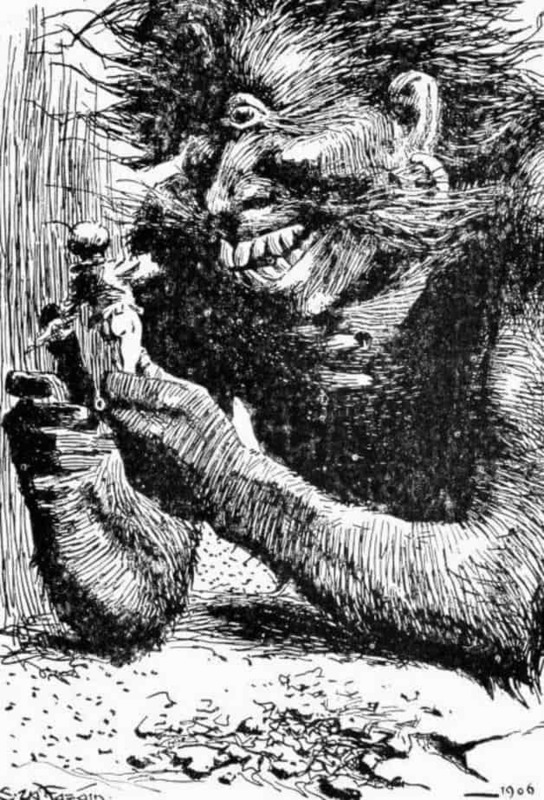 The king, who would hear of no excuse, sentenced the little culprit to be banished into the land of giants beyond the mountains, to stay there for ever and a day unless he could find a giant willing to go to Dooros Wood and guard the fairy tree. When the king had pronounced sentence everyone was very sorry, because the little fellow was a favourite with them all. No fairy harper upon his harp, or piper upon his pipe, or fiddler upon his fiddle, could play half so sweetly as he could play upon an ivy leaf; and when they remembered all the pleasant moonlit nights on which they had danced to his music, and thought that they should never hear or dance to it any more, their little hearts were filled with sorrow. The queen was as sad as any of her subjects, but the king’s word should be obeyed. When the time came for the little fellow to set out into exile the queen sent her head page to him with a handful of berries. These the queen said he was to offer to the giants, and say at the same time that the giant who was willing to guard the tree could feast on berries just as sweet from morn till night. As the little fellow went on his way nearly all the fairies followed him to the borders of the land, and when they saw him go up the mountain towards the land of the giants, they all took off their little red caps and waved them until he was out of sight. On he went walking all day and night, and when the sun rose on the morrow he was on the top of the mountain, and he could see the land of the giants in the valley stretched far below him. Before beginning his descent he turned round for a last glimpse of fairyland; but he could see nothing, for a thick, dark cloud shut it out from view. He was very sad, and tired, and footsore, and as he struggled down the rough mountain side, he could not help thinking of the soft, green woods and mossy pathways of the pleasant land he had left behind him. When he awoke the ground was trembling, and a noise that sounded like thunder fell on his ears. He looked up and saw coming towards him a terrible giant, with one eye that burned like a live coal in the middle of his forehead, his mouth stretched from ear to ear, his teeth were long and crooked, the skin of his face was as black as night, and his arms and chest were all covered with black, shaggy hair; round his body was an iron band, and hanging from this by a chain was a great club with iron spikes. With one blow of this club he could break a rock into splinters, and fire could not burn him, and water could not drown him, and weapons could not wound him, and there was no way to kill him but by giving him three blows of his own club. And he was so bad-tempered that the other giants called him Sharvan the Surly. When the giant spied the red cap of the little fairy he gave the shout that sounded like thunder. The poor fairy was shaking from head to foot. “What brought you here?” said the giant. “Unless what?” roared the giant, and he gave the fairy a touch of his foot that sent the little fellow rolling down head over heels. “Sharvan took him up gently between his finger and thumb.” Illustration by S.W. Fazin, published in Irish Fairy Tales by Edmund Leamy (1906), Magill and Son. The poor fairy lay as if he were dead, and then the giant, feeling sorry for what he had done, took him up gently between his finger and thumb. The fairy took three berries from the pocket of his little green coat, and gave them to the giant. The giant looked at them for a second. He then swallowed the three together, and when he had done so, he felt so happy that he began to shout and dance for joy. “More, you little thief!” said he. “More, you little–––what’s your name?” said the giant. “Pinkeen, please, Mr. Giant,” said the fairy, as he gave up all the berries. The giant shouted louder than before, and his shouts were heard by all the other giants, who came running towards him. When Sharvan saw them coming, he caught up Pinkeen, and put him in his pocket, that they shouldn’t see him. “What were you shouting for?” said the giants. “You did not shout like a man that was hurt,” said they. “What is it to you what way I shouted?” said he. “You might give a civil answer to a civil question,” said they; “but sure you were always Sharvan the Surly;” and they went away. When the giants were out of sight, Sharvan took Pinkeen out of his wallet. “Some more berries, you little thief––I mean little Pinkeen,” said he. “I’ll guard every tree in the wood, if I may do that,” said the giant. “You’ll have to guard only one,” said Pinkeen. “How am I to get to it?” said Sharvan. “You must first come with me towards fairyland,” said the fairy. “Very well,” said Sharvan; “let us go.” And he took up the fairy and put him into his wallet, and before very long they were on the top of the mountain. Then the giant looked around towards the giant’s land; but a black cloud shut it out from view, while the sun was shining on the valley that lay before him, and he could see away in the distance the green woods and shining waters of fairyland. It was not long until he reached its borders, but when he tried to cross them his feet stuck to the ground and he could not move a step. Sharvan gave three loud shouts that were heard all over fairyland, and made the trees in the woods tremble, as if the wind of a storm was sweeping over them. “Oh, please, Mr. Giant, let me out,” said Pinkeen. Sharvan took out the little fellow, who, as soon as he saw he was on the borders of fairyland ran as fast as his legs could carry him, and before he had gone very far he met all the little fairies who, hearing the shouts of the giant, came trooping out from the ferns to see what was the matter. Pinkeen told them it was the giant who was to guard the tree, shouting because he was stuck fast on the borders, and they need have no fear of him. Then Pinkeen told his majesty that he had brought with him a giant who was willing to guard the fairy tree. “And who is he and where is he?” asked the king. When the fairies heard this they tossed their little red caps in the air, and cheered so loudly that a bee who was clinging to a rose-bud fell senseless to the ground. Then the king ordered one of his pages to take a handful of berries, and to go to Sharvan and show him the way to Dooros Wood. The page, taking the berries with him, went off to Sharvan, whose roaring nearly frightened the poor little fellow to death. But as soon as the giant tasted the berries he got into good humour, and he asked the page if he could remove the spell of enchantment from him. The page plucked a cowslip, and picking out the five little crimson spots in the cup of it, he flung one to the north, and one to the south, and one to the east, and one to the west, and one up into the sky, and the spell was broken, and the giant’s limbs were free. Then Sharvan and the fairy page set off for Dooros Wood, and it was not long until they came within view of the fairy tree. When Sharvan saw the berries glistening in the sun, he gave a shout so loud and strong that the wind of it blew the little fairy back to fairyland. But he had to return to the wood to tell the giant that he was to stay all day at the foot of the tree ready to do battle with anyone who might come to steal the berries, and that during the night he was to sleep amongst the branches. “All right,” said the giant, who could scarcely speak, as his mouth was full of berries. Well, the fame of the fairy-tree spread far and wide, and every day some adventurer came to try if he could carry away some of the berries; but the giant, true to his word, was always on the watch, and not a single day passed on which he did not fight and slay a daring champion, and the giant never received a wound, for fire could not burn him, nor water drown him, nor weapon wound him. The murdered king had two children––a boy, whose name was Niall, and a girl, who was called Rosaleen––that is, little Rose; but no rose that ever bloomed was half as sweet or fresh or fair as she. Cruel as the tyrant king was, he was afraid of the people to kill the children. He sent the boy adrift on the sea in an open boat, hoping the waves would swallow it; and he got an old witch to cast the spell of deformity over Rosaleen, and under the spell her beauty faded, until at last she became so ugly and wasted that scarcely anyone would speak to her. And, shunned by everyone, she spent her days in the out-houses with the cattle, and every night she cried herself to sleep. Poor Rosaleen felt as if her heart would break, and when the princess and her maids were out of sight she almost cried her eyes out. When the robin saw her crying he perched on her shoulder and rubbed his little head against her neck and chirruped softly in her ear, and Rosaleen was comforted, for she felt she had at least one friend in the world, although it was only a little robin. But the robin could do more for her than she could dream of. He heard the remark made by the princess, and he saw Rosaleen’s tears, and he knew now why she was shunned by everybody, and why she was so unhappy. And that very evening he flew off to Dooros Wood, and called on a cousin of his and told him all about Rosaleen. “And you want some of the fairy berries, I suppose,” said his cousin, Robin of the Wood. “I do,” said Rosaleen’s little friend. “Then tell me what it is, for I would give a hundred lives for Rosaleen,” said her own little robin. “I will take the chance,” said Rosaleen’s robin. “Very well,” said the other. And the two birds flew through the wood until they came within sight of the fairy tree. The giant was lying stretched at the foot of it, eating the berries; but it was not long until a warrior came, who challenged him to battle. The giant jumped up, and plucking a branch from the tree stuck it in his belt, and swinging his iron club above his head strode towards the warrior, and the fight began. The robin perched on a tree behind the giant, and watched and waited for his chance; but it was a long time coming, for the berries were in front of the giant’s belt. At last the giant, with one great blow, struck the warrior down, but as he did so he stumbled and fell upon him, and before he had time to recover himself the little robin darted towards him like a flash and picked off one of the berries, and then, as fast as wings could carry him, he flew towards home, and on his way he passed over a troop of warriors on snow-white steeds. All the horsemen except one wore silver helmets and shining mantles of green silk, fastened by brooches of red gold, but the chief, who rode at the head of the troop, wore a golden helmet, and his mantle was of yellow silk, and he looked by far the noblest of them all. When the robin had left the horsemen far behind him he spied Rosaleen sitting outside the palace gates bemoaning her fate. And saying this she fled, leaving the prince wondering who she could be. The prince then ordered his trumpeters to give notice of his presence outside the palace, and in a few moments the king and all his nobles came out to greet the prince and his warriors, and give them welcome. That night a great feast was spread in the banquet-hall, and the Prince of the Sunny Valleys sat by the king, and beside the prince sat the king’s beautiful daughter, and then in due order sat the nobles of the court and the warriors who had come with the prince, and on the wall behind each noble and warrior his shield and helmet were suspended, flashing radiance through the room. During the feast the prince spoke most graciously to the lovely lady at his side, but all the time he was thinking of the unknown beauty he had met outside the palace gates, and his heart longed for another glimpse of her. When the feast was ended, and the jewelled drinking-cups had gone merrily around the table, the bards sang, to the accompaniment of harps, the “Courtship of the Lady Eimer,” and as they pictured her radiant beauty outshining that of all her maidens, the prince thought that fair as Lady Eimer was there was one still fairer. When the feast was ended the king asked the prince what brought him into his realms. When the king’s daughter heard this she hung down her head and blushed like a rose, for, of course, she thought the prince was alluding only to herself, as she did not know that he had seen Rosaleen, and she had not heard of the restoration of her beauty. Before another word could be spoken a great noise and the clang of arms were heard outside the palace. The king and his guests started from their seats and drew their swords, and the bards raised the song of battle; but their voices were stilled and their harps silenced when they saw at the threshold of the banquet hall a battle champion, in whose face they recognised the features of their murdered king. “Long live Niall!” answered all the others. But no one stirred, and no answer was given. Then the king rushed forward alone, but before he could reach the spot where Niall was standing he was seized by a dozen chiefs and at once disarmed. During this scene the king’s daughter had fled frightened; but Rosaleen, attracted by the noise, and hearing her brother’s name and the cheers which greeted it, had entered the banquet hall unperceived by anyone. But when her presence was discovered every eye was dazzled with her beauty. Niall looked at her for a second, wondering if the radiant maiden before him could be the little sister he had been separated from for so many years. In another second she was clasped in his arms. Then the feast was spread again, and Niall told the story of his adventures; and when the Prince of the Sunny Valley asked for the hand of Rosaleen, Niall told his lovely sister to speak for herself. With downcast eyes and smiling lips she said, “yes,” and that very day was the gayest and brightest wedding that ever took place, and Rosaleen became the prince’s bride. In her happiness she did not forget the little robin, who was her friend in sorrow. She took him home with her to Sunny Valleys, and every day she fed him with her own hands, and every day he sang for her the sweetest songs that were ever heard in lady’s bower.